Life of a Knitphomaniac: My baby is growing up! Hi everyone! How has your week been? Mine has been crazy. My baby youngest child is Paige....so at the age of 19, she is my baby! But she is growing up....she went out of town this past weekend...she came home late last night....she has never been on a plane....and she was going to CO to visit a friend and traveling all alone......so she is growing up alright! This made for a very busy week for me.....Early last week, Antonio was sick....he was better by Wednesday....on Thursday, Paige needed to bring me my car back so they stayed for dinner, then her and Antonio spent the night Friday (so we could get up so early on Saturday)....and I have had Antonio all weekend. His uncle did come pick him up Saturday night to Sunday afternoon.....why do I mention all of this? Because Me + Antonio = Very Little Knitting! OK, on to the knitting! And some new socks for a Hiya Hiya KAL. The pattern is called Team Spirit and it is colorwork....I am using some funky colors, so the colorwork does not really 'stand out' but I think once I get a little farther, it will. This past weekend was the Dallas/Ft. Worth Fiber Festival....and I have a few friends that went. They are so awesome they texted me pictures and bought some yarn for me (and I paid them back of course).....it is nice to have friends willing to spend your money.....Miss Babs has two new yarn bases. One of them is called Killington. It is a sportweight and it has 700 yards...85% merino and 15% silk! It is heavenly! 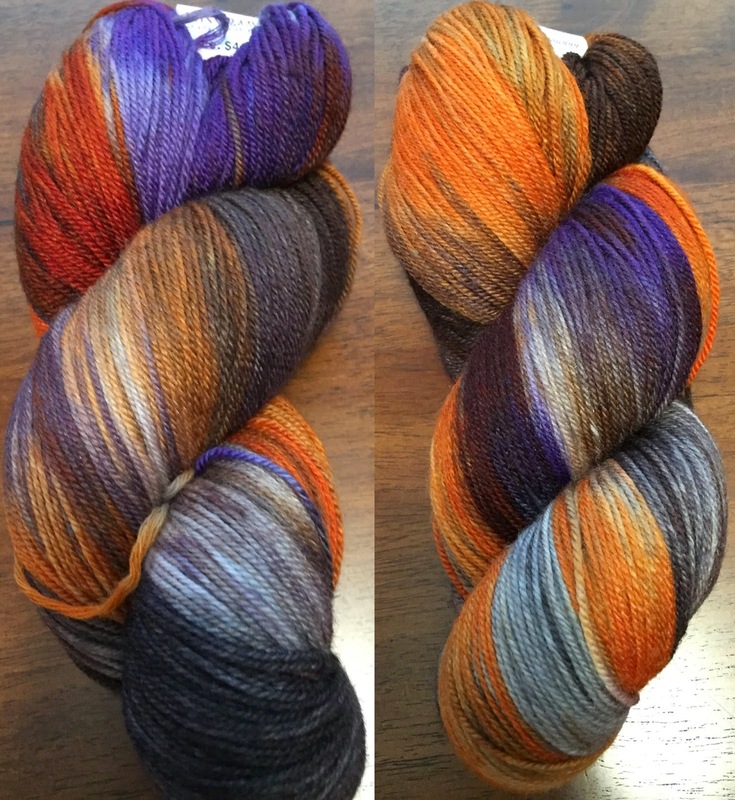 I got two skeins of Bat Sh*t Crazy to make Toujours by Joji Locatelli and one skein of Mayhem because it looks like biker chick with purple...I just loved the colors! My pink yarn that I ordered for the Miss Babs Tour came in too! More turtle purl yarn to make burberry socks for my sister and niece. And a friend of mine snagged some Lollipop yarn, so she let me trade yarn for this skein of Home Grown....reminds me of the Zac Brown Band song....Homegrown! 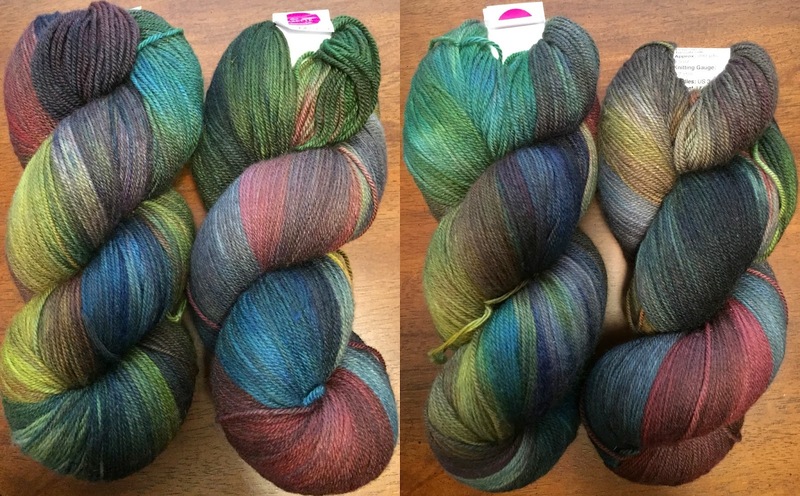 I participated in the DCS Podcast Pigskin Party and I won a skein of yarn from Lilliput....the blues and greens are not really my color....but it is beautiful! This past weekend was the Dallas/Ft. Worth Fiber Festival....and I have a few friends that went. They are so awesome they texted me pictures and bought some yarn for me (and I paid them back of course).....it is nice to have friends willing to spend your money.....I do not have the greatest pictures....so you will have to stay tuned for next week (or I may blog mid week) to see the goodies I got. Lastly.....I have been in the mood for a new purse....I got my tax return and have been eyeing a few bags....a friend of mind suggested I go to the San Marcos Outlet Mall stores to see if I see anything I like....it is about an hour one way...but it was worth it. 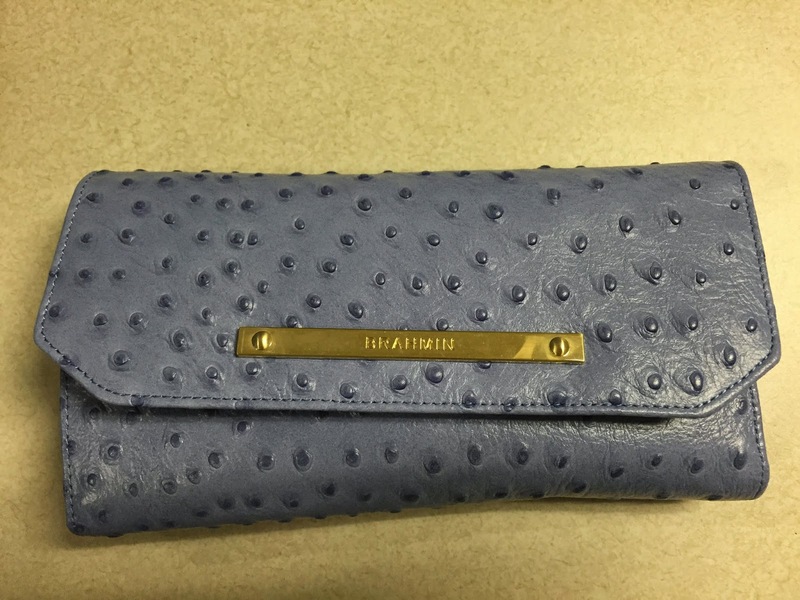 I got this "Weekender Bag" that is meant to be used as a 'bag' but I will use it as a purse...the color is a beautiful periwinkle....but a little more towards the blue side than the purple side.....it is hard to describe....I also got a matching wallet! Bitten Off More Than I Can Chew?